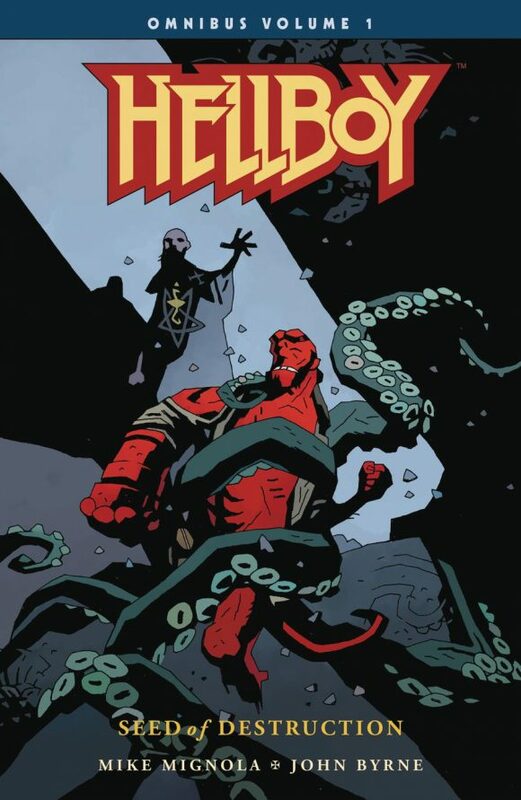 UPDATED 3/23/19: It’s Hellboy Day — celebrating 25 years since the publication of Seed of Destruction #1. Perfect time to re-present this piece. Dig it. 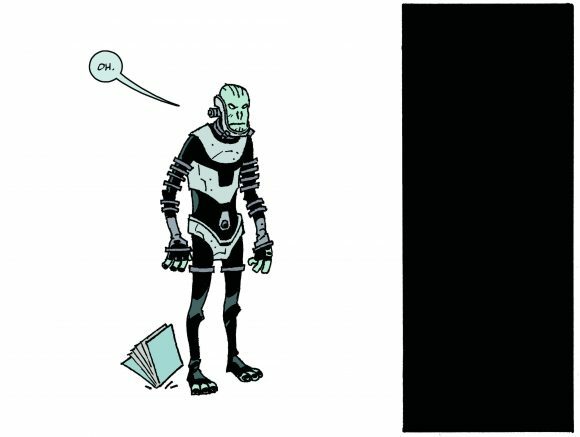 When you want to explore the intracacies of Mike Mignola’s creative vision, a good place to start is with the people who actually help him realize it. Monster stories are seldom about monsters as much as they are about humans. This is not a hot take, it really isn’t news. 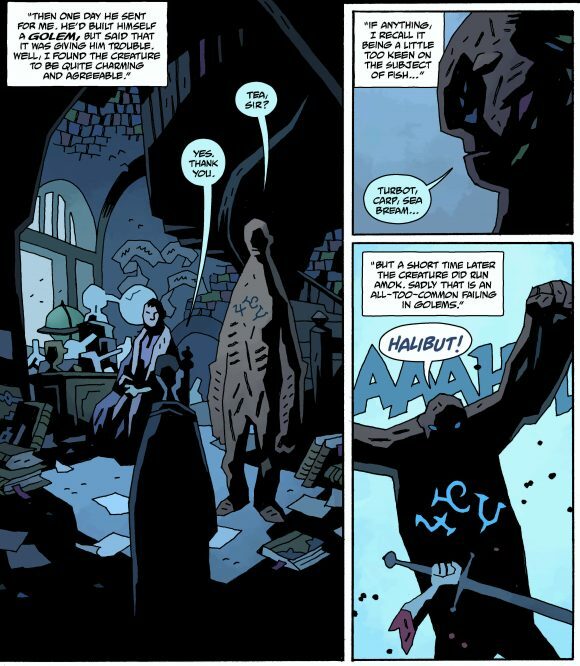 We deal in monsters all day in the Mignolaverse, between Hellboy and all its related titles: B.P.R.D., Abe Sapien, Witchfinder, Lobster Johnson, and the many others. We love to dig up old myths and folklore and mix them in with Mike’s own, and then (hopefully!) we see Hellboy punch some cool, scary, dangerous creature. 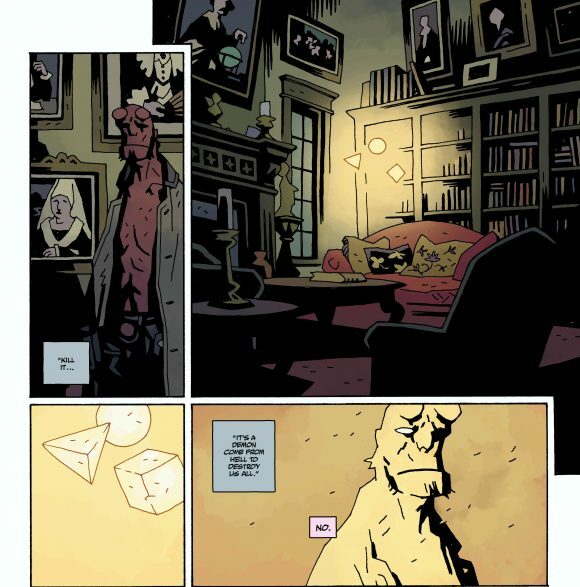 Hellboy in Hell #10, Page 22, Panels 1-4. I’m going to begin at the end, because the end of Hellboy in Hell brings us back to the beginning anyway. When Mike is drawing interiors, we don’t get a script or an outline. He’ll explain the story over a phone call, and then we’ll get in pencils, inks, and after all that, a dialogue script. 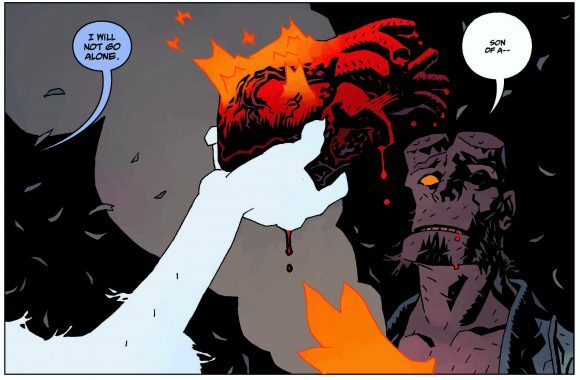 So we didn’t fully know what to expect when the last pages of Hellboy came in, which means I also got punched in the gut when I saw the three shapes here. What do they mean? Death? Fate? We’ll never really tell. 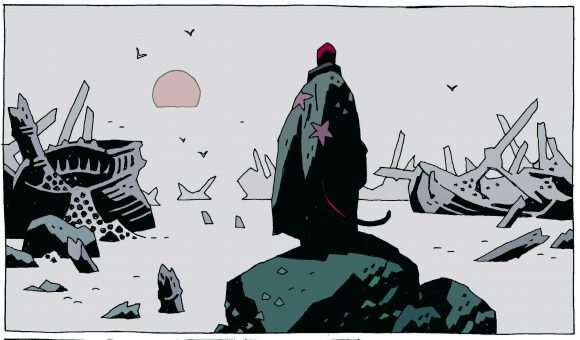 But even with all the many characters and worlds within the Hellboy lore, it’s these small repeated mysteries that make it feel most like home. Seed of Destruction #1, Page 13, Panels 2-5. Frogs! Look at the panel second from the left here, how just that one panel bleeds off the page. Bleeds are something that can be really dramatic, but only when used sparingly. It works so well here because it gives the sense that the frogs really are everywhere, totally uncontained. 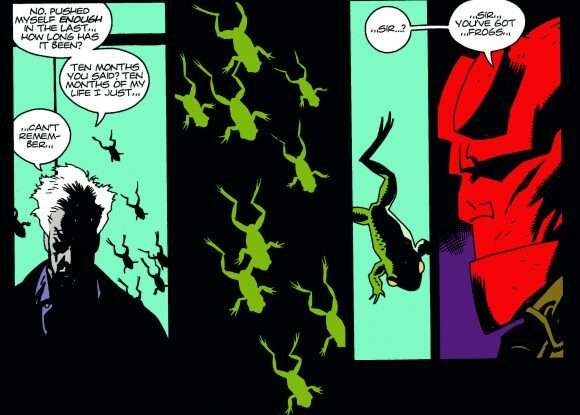 It’s a fantastic example of comics storytelling, and a great way to twist fairly normal frogs into something horrible. 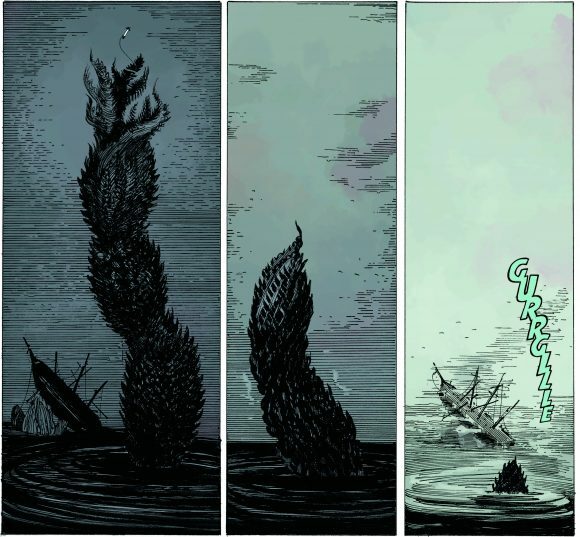 Into the Silent Sea, Page 44, Panels 2-4. Mike and Gary Gianni had planned to work together on a Hellboy book for years, and I was lucky to have joined the team not long before they started. He and Mike co-wrote the story, and the serpent at the end was a nice mix of classical sea-story myth and Mike’s own style of monster. Often our monsters just go away, defeated but not always killed. That’s been the crux of B.P.R.D. in a way, that monsters are a fact of life in this universe. And here we have the great serpent of Silent Sea, slinking back into the deep, until someone is stupid enough to summon it again. But these creatures are always there. And someone is always dumb enough to bring them back. Wolves of St. August #1, Page 9, Panel 1. Mike does a lot of small panels focusing on details in the scene. We always dissuade artists from trying to draw too much like Mike—it would never work—but sometimes someone will work in one or two little detail panels like this and it makes the page feel right at home. Sometimes you just need to stop and look around a bit. 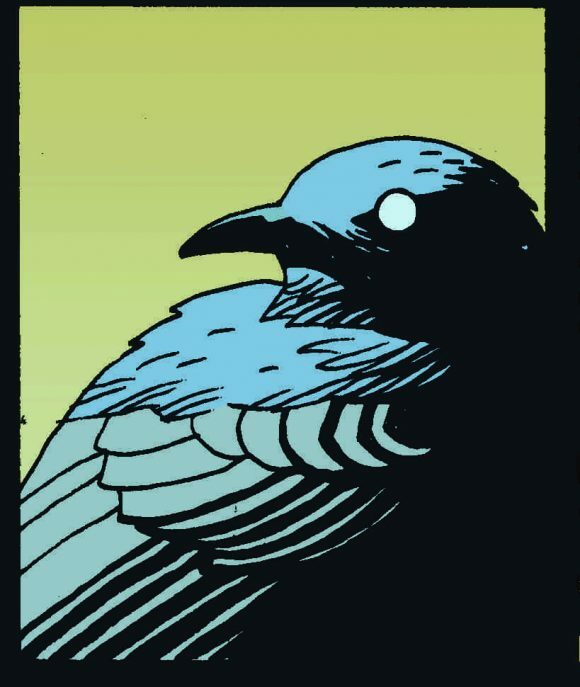 I guess this bird close-up really worked for Mike, because he kept doing it. There are many of these small panels of animals, but as far as I can tell, this is the first one. The Fury #3, Page 18, Panel 1. Duncan Fegredo, ladies and gentlemen, giving us the exact moment that Hellboy realizes he’s going (back) to Hell. 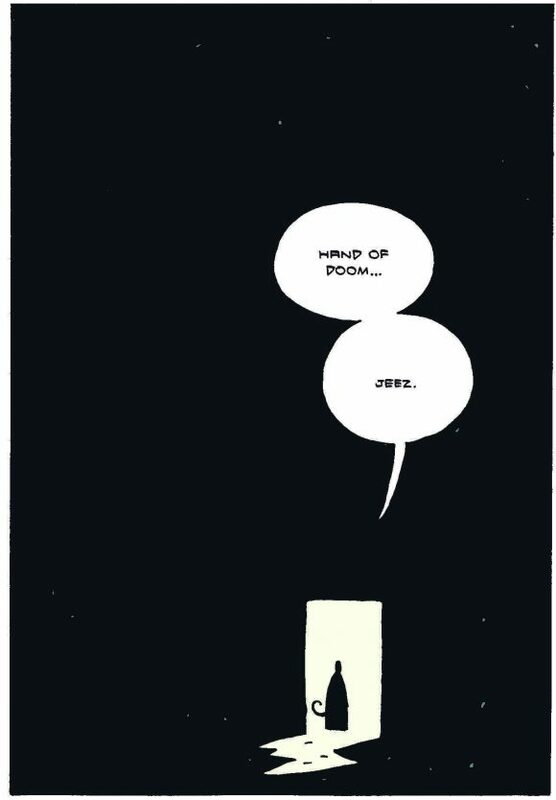 It’s a beautiful panel, and the most striking bit is the humanity of Hellboy in the look on his face. “Son of a –,” indeed. B.P.R.D. : Hell on Earth #139, Page 17, Panels 4-5. This is Laurence Campbell’s art here, the death of the Black Flame. This is a sequence that works well even without lettering, because Johann’s rage and the ultimate futility of beating a dead enemy, speaks for itself. I am also proud to say that the original art board of this page is among the treasures hanging on the walls in my office. I like to stand in front of it and stare at it sometimes. Heads, Page 5, Panels 1-3. All of our B.P.R.D. guys have been through a lot. Way more than any human (or non-human, for a lot of them) should have to deal with. Saying that humor gets them through it would be oversimplifying and a bit trite, but it certainly plays a part, and no one does humor amid chaos quite like Mike. The Island, Page 3, Panel 1. Hellboy is so restless for so much of his story. Compare this to those scenes by the beach in Hellboy in Hell with all the souls staring out at the water, and then Hellboy’s last walk on the beach at the end of Hellboy in Hell #10. He’s just wandering, and even in death when he’s down in Hell, he still keeps wandering until he finds a little spot to make his home. I couldn’t leave either of these out, but they’re so well-known that I’ll just use one of my 13 slots for them. True classics of our special brand of weirdness. 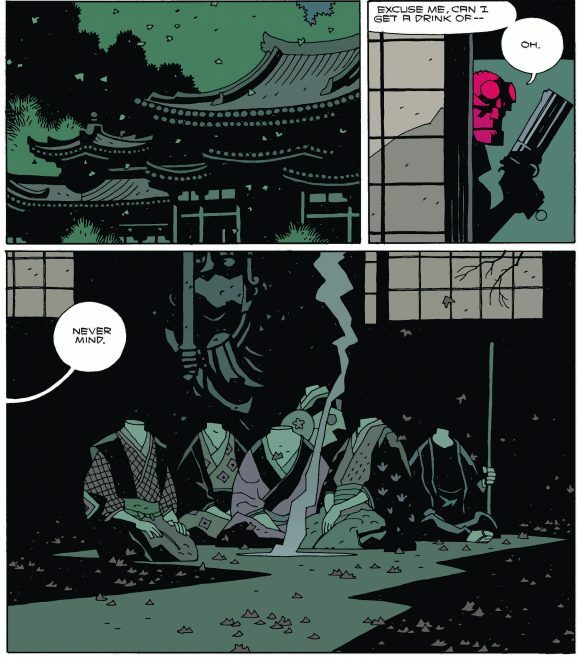 Hellboy in Hell #7, Page 13, Panels 1-3. Of all the bit characters we only see once in this universe, this fish-obsessed golem is my all-time favorite. There’s a tendency in these books for Mike to tell stories within stories, and these three panels are a good example of that. These short but substantial bits that hint at bigger things really enrich the universe. The Right Hand of Doom, Page 9, Panel 7. 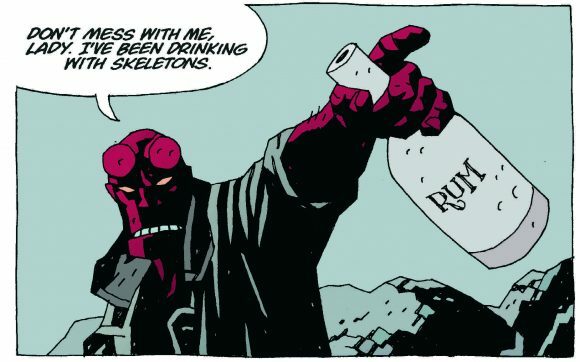 I like this one because it’s basically the entire Hellboy plot in a nutshell, if narrated by Hellboy. The Visitor: How and Why He Stayed #4, Page 21, Panels 4-5. 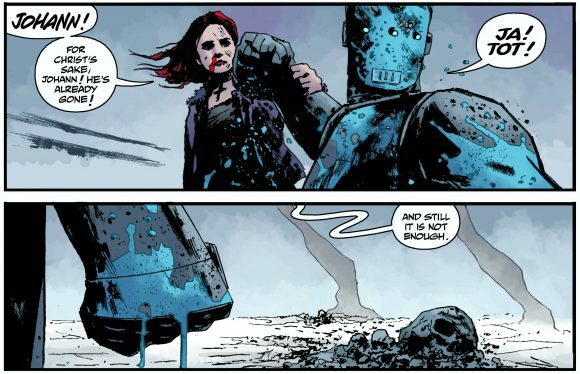 When we started work on The Visitor: How and Why He Stayed miniseries a couple of years ago, we wanted to do a story that felt like it was more than a series of Hellboy moments that we’ve already seen, viewed over the shoulder of an alien. What we ended up with was one of the most human stories we’ve told, with the twist that the protagonist isn’t human at all. The comic Chris Roberson and Paul Grist gave us hit heaviest in Issue #4, particularly in this moment. 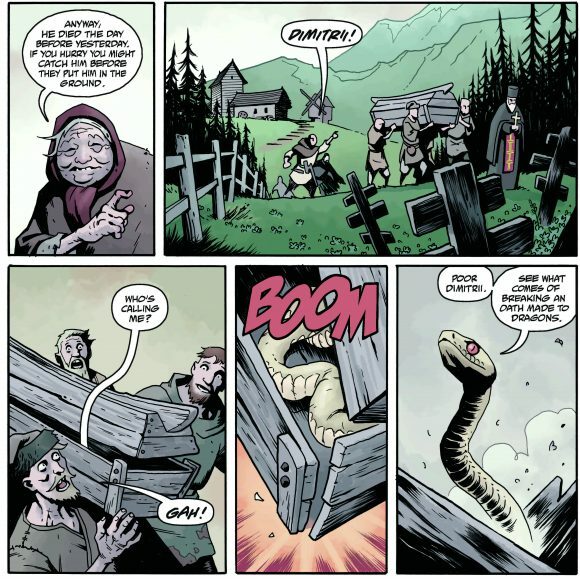 Koshchei the Deathless #2, Page 9, Panels 3-7. We all feel like we’re really getting away with something when it comes to Koshchei the Deathless. A six-issue series about two people talking in a pub should feel indulgent, and it’s possible that no other creative team could pull it off. But there’s something about Mike and Ben collaborating that just works, so when a dead guy turns into a snake it feels natural. Natural! Of course, he became a snake, why should we ever have doubted that? Happens all the time, at least in these books. — VIDEO SPECIAL: Mike Mignola Talks HELLBOY and Creativity. Click here. — Dig These Upcoming HELLBOY Collectibles. Click here.